The 49ers’ kicking situation for the 2019 season is still up in the air. Though the team applied the one-year franchise tag on Robbie Gould earlier this offseason, the 36-year old has yet to sign it, with negotiations between the two sides appearing to have reached an impasse according to 49ers beat writer Matt Maiocco. 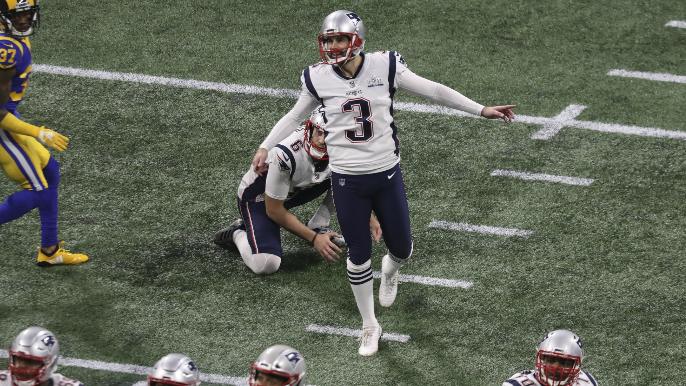 This explains San Francisco’s interest in longtime Patriots kicker Stephen Gostkowski, also reported by Maiocco on Tuesday morning. Gostkowski, 35, remains unsigned by New England after wrapping up his 13th year with the franchise. Gostkowski is one of the few current NFL kickers whose resume stacks up with Gould’s. Gould (87.7 %) and Gostkowski (87.3 %) rank second and third in all-time field goal accuracy respectively. Gostkowski has actually had the more decorated career of the two, with four Pro Bowls, two All-Pro selections, and three Super Bowl rings. Gould made one Pro Bowl and All-Pro team in 2006 as a member of the Bears. Gould was the most accurate kicker in the league last season, making 97.1 percent of his kicks (33-for-34). Gostkowski was ranked 19th, making 84.4 percent (27-for-32). Gould will make just under $5 million next season if he signs the tag. Gostkowski is projected to have a market value of $3.8 million per year according to Spotrac. Gould has been a member of the 49ers since 2017. His 39 makes in 2017 were the most in the NFL.